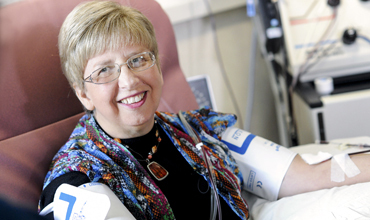 Ebola survivor Nancy Writebol has donated plasma repeatedly for a new Emory-led clinical trial. Two new Ebola studies are under way here, one focused on developing treatment with plasma from Ebola survivors and the other on characterizing the immune response in such patients. Pathologist Anne Winkler is overseeing a study to collect "convalescent" plasma from U.S. Ebola survivors and prepare and store it for use in future treatment of those with acute infection. Thus far, her group has collected plasma from six donors, transfused 16 units, and has 18 more units of plasma stored in a dedicated freezer at Emory University Hospital (EUH) in preparation for future Ebola patients in the U.S.
Winkler works with Shannon Bonds, a hemapheresis nurse at EUH, who collects blood from Ebola survivors, separating the plasma from the red blood cells, which are infused back to the donor. Bonds then carries the plasma, which retains antibodies and other immune system properties, next door to Woodruff Memorial Research Building, where she and Winkler use a device called the INTERCEPT Blood System developed by Cerus Corporation to inactivate non-Ebola pathogens possibly contaminating the plasma. "We are testing the plasma before and after the protocol for Ebola antibodies and their neutralizing ability," says Winkler. "We not only want to characterize the immune profile of the plasma but also make sure that we aren't altering the Ebola antibodies during the INTERCEPT process." Although most of the patients treated in this country received varying amounts of convalescent plasma as part of their treatment, no one knows if it was effective or what constitutes optimal dosage or timing, says Winkler. Nor does anyone know the exact Ebola antibody titer in the doses received. Right now, Emory is the only storage facility for this protocol, but Winkler's group is working with University of Nebraska, the NIH, American Red Cross, and America's Blood Centers to establish a network of additional facilities near where survivors live. Winkler is also consultant to a parallel trial of plasma in Liberia. The basic science study also seeks to analyze the immune systems of Ebola survivors, in this case the four patients who were treated at Emory. 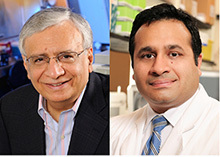 Led by Rafi Ahmed, Emory Vaccine Center director, and infectious disease specialist Aneesh Mehta, the team has received a grant through the Defense Advanced Research Projects Agency (DARPA) for up to $10.8 million over three years. The group includes collaborators from around the country in addition to the CDC. The investigators plan to isolate antibody genes from patients’ white blood cells, produce the antibodies in cell culture, and test their abilities to stick to Ebola virus proteins and neutralize the virus. The samples will come from blood collected, with patients' consent, during their stay at EUH and after their discharge. "Our goal is to have a panel of fully human monoclonal antibodies with activity against Ebola," Ahmed says. "Our preliminary data indicates that the immune systems of patients were able to actively produce antibodies." An expected outcome of the project is to develop full human antibodies targeting the Ebola viruses to guide the development of improved therapeutics and vaccines. Researchers plan to find out whether patients' immune systems produced antibodies that are reactive across more than one strain of Ebola. Ahmed and colleagues were able to perform similar research during the 2009 H1N1 flu outbreak. They learned that some people developed antibodies that are cross-reactive to a variety of flu strains, information that is guiding efforts to design a "universal" flu vaccine. Ahmed's team also plans to identify T cells responsible for reacting against Ebola virus. "This will allow us to fill a gap in our knowledge," he says. "T cells are a critical part of antiviral immune responses, but there is minimal information about T cell responses to Ebola and about viral proteins targeted by human T cells. This information also will be useful in Ebola vaccine development." Read more. Repurposing old drugs for new uses continues to attract increasing attention because it is a strategy that benefits all parties involved, says Cliff Michaels, senior licensing associate with Emory's Office of Technology Transfer (OTT). "Many of the usual risks involved in developing new drugs—time, money, and failure rate—are diminished for the researchers, the university, and the companies we partner with. Perhaps best of all, the speed with which lab results can be translated into helping patients is high as well." Flumazenil was developed for treating overdose of benzodiazepine sedative hypnotics but was found by sleep researchers David Rye and Andrew Jenkins to be useful for patients with hypersomnia. Reformulated as a lozenge or transdermal cream, it restores wakefulness in patients who are unresponsive to traditional wake-promoting agents, such as stimulants. Rapamycin, originally developed as an antifungal agent, was found to have potent immunosuppressive and anti-inflammatory properties and has been used to prevent rejection of transplanted organs. School of Medicine Dean Chris Larsen, Emory Vaccine Center Director Rafi Ahmed, and colleagues at the Emory transplant and vaccine centers found that the drug could also boost T cell immunity from immunizations. With proper timing and dosing, Ahmed discovered that this therapeutic, given with vaccinations, results in an increase in high-quality memory T cells that respond more efficiently to future pathogen challenges compared with untreated controls. There are also potential applications for chronic infections and benign and malignant tumors. Osanetant was first tested for schizophrenia and then abandoned. Yerkes scientists Kerry Ressler, Raül Andero Galí, and Brian Dias discovered that it made memories of frightening events less durable in mice, by blocking the “Tac2 gene” pathway involved in fear learning and consolidation of fear memories. 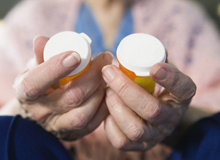 The drug may prove to be therapeutic for people with anxiety or fear disorders, such as PTSD. 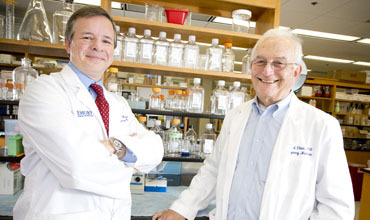 A combination of rapamycin and imatinib (Gleevec) was found by researcher Jack Arbiser in dermatology to be highly effective in decreasing tumors in mouse models of tuberous sclerosis, a genetic disorder that causes nonmalignant tumors to form in many different organs, primarily the brain, eyes, heart, kidney, skin, and lungs. The combination was found to be far better in preventing tumor growth than either drug alone. TAK-242, a Japanese drug originally developed to treat sepsis, went through safety trials but didn’t show efficacy. But researchers Fang Hua (no longer at Emory), Donald Stein, and Iqbal Sayeed, in emergency medicine, found that TAK-242 could be used as a nonsurgical treatment for ischemic stroke because it blocks inflammatory signaling. In December, the New England Journal of Medicine published the disappointing results of a four-year, 49-center study of progesterone for traumatic brain injury (TBI): Despite much evidence from phase 1 and 2 trials to the contrary, the verdict was that progesterone offers no significant benefit. The full story, however, may be more complex. Emergency medicine physician David Wright, who led the national study, believes the results reveal more about the historic shortcomings of tools used to define and measure TBI and TBI recovery than the efficacy of progesterone. "This is a wake-up call," says Wright. "We need to look at this in a different way and go back to the drawing board. As Donald Stein [an Emory scientist, also in emergency medicine, who has studied progesterone for brain injury for three decades] will tell you, the failure rate for neuroprotective agents is phenomenal—a thousand different drugs have been studied for TBI and stroke, and there are zero successes. You'd think just statistically that you'd have a false positive somewhere." Wright says this not because the study was poorly conceived—he regards it as an extraordinarily good faith effort. "One person at the NIH said it was one of the best trials that he had been involved in, partly because we tried to control it to such a great degree. We incorporated ultra-early administration of the drug [within four hours of the patient's arrival in the ER] and other measures to keep management of patients as consistent as possible." But the heterogeneity of the disease is difficult, he adds. "One person's TBI is not another's. We have no good definition of TBI." The heterogeneity of the human subjects contrasts starkly with the similarity of animal subjects in preclinical studies. "In the animal studies, we use only one or two strains of rats, and they have all been raised and injured in the same way. With humans, we have young and old, some with multiple complications, some are alcoholics, some got rehab and some didn't," says Wright. Controlling for such mismatches was simply outside the financial and practical boundaries of this large, multi-center study. Another shortcoming, in retrospect, was the tool used to measure outcome, says Stein. "The Glasgow coma score is a blunt instrument," he says. "It's easy to administer and quick and inexpensive. But it's inadequate to assess recovery of intricate brain functions. "With lab animals, it often takes us weeks to assess recovery," he says. "When we look at stroke or TBI, for example, we have 52 quantitative measures, hour by hour, day by day, month by month. We can say, 'At day 7, this subject had exactly 56% gait recovery compared with its pre-injury state,' so we know just how much recovery can be seen at any time we choose to measure this behavior. " One bright note on the horizon is that Wright and Stein are far from alone in recognizing the limitations of clinical TBI studies to date. Last fall, a $17 million, US Department of Defense–funded initiative was launched to drive development of better-run clinical trials for TBI treatments. According to principal investigator Geoffrey Manley, a UCSF neurosurgeon, "TBI lags 40 to 50 years behind heart disease and cancer in terms of progress and understanding of the actual disease process and its potential aftermath." Wright, a consultant on this study, believes the jury is still out on the benefits of progesterone for TBI. "But we have finally started to build consensus," he says, "that the techniques we've been using over and over again up to now won't give us the definitive answers we're looking for." The development of new drugs, treatments, and technologies doesn't begin and end in the lab. It takes a talented team of people to transform discoveries into marketable products that directly benefit people's health. At Emory we call that team the Office of Technology Transfer (OTT), and they are celebrating their 30th anniversary this year. Since forming in 1985, OTT, led by Dr. Todd Sherer, has created an extraordinary 72 start-up companies, which have attracted funding, brought products to market, created jobs, and improved human health. From pharmaceuticals to advanced imaging to virtual reality treatments and beyond, Emory's start-ups are making a tangible impact on real people's lives. Congratulations to the OTT team on an impressive 30-year track record of helping Emory's scientific discoveries realize their full lifesaving potential. See related article. Earlier this month, Emory's Max Cooper was celebrated in Nature for his discovery of B cells (the source of all circulating antibodies) in the 1960s, while working with colleagues at University of Minnesota. The insight "shaped the course of modern immunology," say the authors. "This account underscores how discovery opens a pipeline of unknown consequences," says EVPHA Wright Caughman, "many modest, some of little impact, but some others unimaginably powerful for decades." On Feb. 2, the medical school departments of Neurology and Psychiatry/Behavioral Sciences and the Emory Sleep Center moved to a consolidated location in Building 12 at Executive Park, joining adult, child and adolescent psychiatry programs already at that location. The move is an integral part of the Emory Brain Health Initiative, designed to facilitate innovative partnerships among these specialties. In addition to the Emory Sleep Center, specific clinic services that made the move include the Alzheimer's program, geriatric psychiatry and the Fuqua Center for Late-Life Depression, movement disorders, epilepsy, general neurology, neuromuscular disorders, and neuropsychology. Programs and services not moving to Executive Park include the ALS, stroke, and vestibular programs and neurosurgery. Emory University's 2014 annual report, Achievement and Celebration, now online, is a compilation of financial data, videos, and text illustrating three Emory core values: excellence, integrity, and optimism. Emory's treatment of the first Ebola patients in the Western Hemisphere is highlighted in the report's section on optimism. Emory Healthcare opened an on-site primary care clinic at The Coca-Cola Company's Atlanta headquarters on January 2. Richard Kim will serve as medical director. The clinic also will be staffed by two nurse practitioners and eight clinical and administrative staff. Lung injury researcher Charles Downs (nursing school) was recently honored as the fifth recipient of the Woodruff Early Independence Award. This award is modeled after the NIH award by the same name and supports the work of exceptional early-career scientists. Veda Johnson (pediatrics) and Carol Hogue (public health) received a five-year, $1 million award from the NIH to evaluate school-based health centers in Georgia. Read more. Michael M.E. Johns, professor in the schools of medicine and public health and former EVPHA and Emory chancellor, will receive the 2015 Castle Connolly National Physician of the Year Award for Lifetime Achievement, to be presented in March. Dan Owens and Marilyn Margolis have been named CEO of Emory University Hospital Midtown and Emory Johns Creek Hospital, respectively. Read more. Richard Krause, dean of Emory's medical school from 1984 to 1988, died on Jan. 6 at age 90. Read more. Feb 23 - April 13: Ebola Faculty and Community Forum. More info. 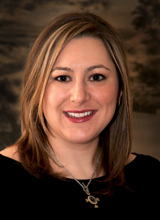 Feb. 24: "Service Delivery: Implications for US Healthcare." Healthcare Innovation Symposium 13, Leonard Schlesinger, EUH Auditorium, 4:30-6:30 p.m. More info. March 16: Clinical Research Boot Camp 201. 8-4:30 p.m. WHSCAB auditorium. More info. May 17-20: "Beings" ethics summit. More info.